What is supply chain visibility? Depending on where you go and whom you ask, the answer might differ. True end-to-end visibility extends beyond just tracking containers and shipping logistics. It disrupts the traditional corporate information silos and provides company-wide transparency that can greatly improve the global trade management process. Often, the given definition of supply chain visibility fails to encompass the essence of "true visibility," like what you achieve in a supply chain control tower scenario. Every step in the supply chain needs to be both visible and managed; this requires all partners and data to be digitized. Whether your company creates lifesaving medications like EpiPen, Marvel Comics merchandise, or anything in between – no one is immune from the threat of lost business due to product shortages. 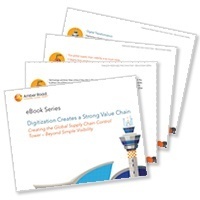 Having effective supply chain visibility in place can facilitate the agility required to meet the ebb and flow of demand, but first you must start with creating a digital global supply chain control tower.